Marshall's latest CD of jazz standards includes: Have You Met Miss Jones, Girl From Impanema, My One and Only Love , How My Heart Sings. Here's That Rainy Day Dolphin Dance , Summertime, Windows, ' Round Midnight, I Remember You. Kye Marshall (cello), Don Thompson (bass & piano), Dan Ionescu (guitar), Mark Duggan (percussion). To order please Click Here. 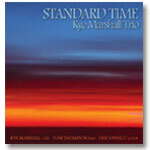 Kye Marshall�s 2nd jazz CD of original compositions featuring Kye Marshall (cello), Don Thompson (piano), Kevin Barrett (guitar), Jim Vivian (bass) and Terry Clarke (drums). To order please visit Canadian Music Centre. Kye Marshall�s first CD of original jazz compositions featuring Kye Marshall (cello), Don Thompson (piano), Kevin Barrett (guitar), Andrew Downing (bass) and Anthony Michelli (drums). This CD is currently available for purchase online at the Canadian Music Centre. Winter�s End is available at major record stores. On 10 of her own pieces, Toronto-base Kye Marshall's smooth but yearning cello gets sensitive backing from a quartet led by Don Thompson's piano, with guitarist Kevin Barrett, bass Andrew Downing and drummer Anthony Michelli. The classicist now explores new music, giving the ensemble opportunity to exploit elegiac sweeps on "Ides of March," a balladic version of "Way Back When" based on bebop anthem "Confirmation," the swampy "A blues in A," plus the quirky "Mad Mary." It's a graceful chamber jazz with serious edge, enjoying courtly skirmishes with complex structures. "Alimbo" surges while "Twilight" and "Evensong" are all polished politeness. ...Their playing was such that at the end of the evening, on was quite unaware that one had had two-and-a-half hours of jazz - traditional and modern. Kye Marshall on cello, who has played in Uxbridge in the past, exploited every possibility her instrument offers: her improvisation in produced tones ranging from the cello's familiar sonority almost to the tones of a saxophone.